Brain abscess is a bacterial infection within the brain. The brain is usually well insulated from infection by bacteria, protected by the skull, the meninges (tissue layers surrounding the brain), the immune system, and the highly regulated barrier between the bloodstream and the brain. Under certain circumstances, however, bacteria can invade the brain and cause a localized infection called an abscess. Brain abscess is relatively rare, accounting for 1 in 10,000 hospital admissions. Single abscess occurs in 75% of cases, and the remainder of cases involve multiple abscesses. If not treated, brain abscess is almost always fatal. Other sources of bacteria include lung infections, abdominal infection, infection of the heart's lining (endocarditis) penetrating heart wounds, and neurosurgery. Acquired Immune Deficiency Syndrome (AIDS) or the presence of another immune deficiency greatly increases the risk of brain abscess. Approximately 25% of cases have no detectable cause of infection. Brain abscess can be caused by a variety of organisms, many of them related to ear and sinus infections. Many times brain abscess cases are caused by two or more bacteria. In 30-60% of cases, the bacteria combination includes streptococci, microorganisms that can live without oxygen (anaerobes), and enterobacteria. A small number of cases are caused by yeast, fungi, and single-cell organisms (protozoa). Diagnosis of brain abscess is performed by using a computed tomography scan (CT) or a magnetic resonance imaging (MRI) scan to determine the site of infection. Tissue removal (biopsy) is usually performed as well. A biopsy is performed to determine the type of bacterium involved. Biopsies can also be used to rule out tumor or other noninfectious localized lesions, which may look the same on the scans. Other tests are performed to determine the source of the infection. These tests include blood cultures, x rays of the chest, and a physical exam of the ears, sinuses, and teeth. A test for human immunodeficiency virus (HIV) is usually also performed. Treatment for brain abscess begins with intravenous antibiotics, chosen to match the infecting bacterium if known, or to cover a wide spectrum of possibilities if not. Treatment usually continues for six to eight weeks. Aspiration surgery is almost always done to drain the abscess. In this procedure, a needle is guided to the infected site by CT scan, and fluid is removed (aspirated) from the abscess. Aspiration may be repeated several times until the bacteria are completely killed or removed. Surgical removal of infected or dead tissue may be needed in some cases. For patients with many sites of infection, aspiration or surgical removal is not done because of the increased difficulty and risk of the procedure. For these patients, antibiotic therapy alone is used. Steroid treatment is controversial, but may be indicated in some cases. Even with prompt treatment, brain abscess is fatal in about 20% of cases. About half of those who survive have some residual neurological problems, including seizures in many patients. There are several reasons why patients with brain abscess can have a poor prognosis. The illness may not be diagnosed correctly or an accurate diagnosis may take additional time. The patient may receive an antibiotic that does not match the infecting organism. Sometimes the infection may not be limited to a definite area in the brain, making diagnosis and treatment difficult. The small number of cases caused by fungal infection may take additional time to diagnose. A patient may also have a poor prognosis because there is more than one abscess, the location of the abscess may be deep within the brain, or the infection may have moved into many locations within the brain. Severe complications can result from brain abscess, including comma and brain rupture. In 80-100% of cases involving brain rupture, the patient dies. Brain abscess may be preventable by prompt and aggressive treatment of the infections which give rise to it, especially sinus and ear infections. Aspiration — Removal of fluid from a closed space through a needle. 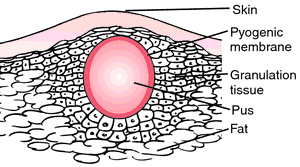 Biopsy — The removal of a tissue sample for examination. a pocket of infection in a part of the brain. It is usually a result of the spread of an infection from another source, such as the skull, sinuses, or other structures in the head. The infection also may be secondary to a disease in the bones, the nervous system outside the brain, or the heart. Also called cerebral abscess, intracranial abscess. A focal collection of pus within the cerebral or cerebellar parenchyma, arising from direct spread of an adjacent infection (e.g., meningitis, sinusitis, mastoiditis) or from haematogenous spread from elsewhere. 1–2% of all intracranial space occupying lesions in developed countries and 8% in developing countries. Solitary abscesses are typically temporal or cerebellar, and caused by direct spread from adjacent foci (paranasal sinus); multiple abscesses typically develop at the junction of the white and grey matter of regions supplied by the middle cerebral artery. (3) Apparent—localising signs, CSF pressure effects. History, CT scan; high index of suspicion in patients with unexpected symptoms and signs if they have received antibiotics. The serious consequence of access of pus-forming organisms to the inner parts of the brain, by spread through the bone following middle ear infection (OTITIS MEDIA and MASTOIDITIS) or severe sinusitis, by spread by the blood, or as a result of a penetrating injury of the brain by an infected object or missile. encephalon; that part of the central nervous system contained within the cranium, comprising the forebrain, midbrain and hindbrain, and developed from the embryonic neural tube. It is connected at its base with the spinal cord. The brain is a mass of soft, pinkish gray nerve tissue. For specific brain diseases see under headings relating to etiology and lesion. common signs caused by an abscess in the brain are circling, rotation of the head, abnormal reflexes in one eye. The CSF may show evidence of infection. acute or chronic insufficiency of the blood supply to the brain causes anoxia which causes clinical signs that vary with the severity of the deprivation. Acute anoxia causes muscle tremor, recumbency, convulsions and death or recovery if the anoxia is relieved soon enough. Chronic anoxia causes lethargy, weakness, blindness and sometimes convulsions. In either case there may be permanent damage. irreversible coma with apnea, loss of all brainstem reflexes and absence of activity on an electroencephalogram. relieving the pressure within the cranial vault. This may be done surgically by opening the cranium, or medically by administering hypertonic solutions of slowly metabolized materials, such as mannitol, intravenously. an important part of a number of acute diseases, e.g. lead poisoning, encephalitis, salt poisoning in swine, polioencephalomalacia of ruminants and hypoxia due to any cause. Clinically manifested by blindness, opisthotonos, nystagmus, recumbency and tonic convulsions. Inherited in polled and horned Herefords; calves are recumbent at birth and are never able to stand but consciousness is normal. See also neuraxial edema. may occur with trauma, in extradural, subdural or intraparenchymal locations. They can cause progressive increase in intracranial pressure and eventually death. intracranial hemorrhage affecting the brain usually follows traumatic injury but spontaneous hemorrhage may result from an intrinsic vascular lesion. Loss of consciousness is a common sign followed by residual signs depending on the locality and size of the hemorrhage. 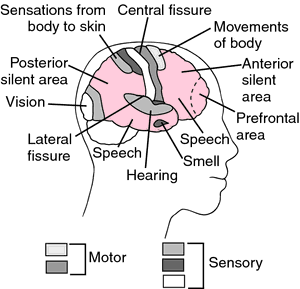 Ataxia and convulsions are common sequelae. 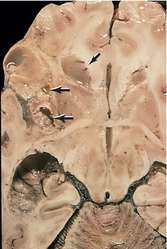 displacement of brain from the cranial vault through the foramina (tentorial notch or foramen magnum) or ventral to dural septae. The usual causes are brain edema or hemorrhage with resulting increase in intracranial pressure. occurs in cranial trauma that fractures the skull, causes severe acceleration or deceleration, or penetrates the skull and brain tissue. occurs in phalaris spp. poisoning; a characteristic greenish brown color grossly of the gray matter in brainstem nuclei and spinal cord, caused by a suspected lysosomal storage of granules of pigment material; usually associated with some degree of Wallerian degeneration within spinal cord tracts. a radiographic, magnetic or nuclear medical procedure for the detection of brain tumors, abscesses, hematomas and other intracranial lesions. Not widely used in veterinary medicine because of the expensive equipment required. injury to the brain, including that caused by migrating worm larvae, will have diffuse effects including the development of edema, and local effects due to pressure by displaced bone or to hemorrhage. Initial shock, manifested as unconsciousness, is likely to be followed by residual localizing signs, e.g. facial paralysis, head rotation. cause signs suggestive of local space-occupying lesion in the cranial cavity, including the increased intracranial pressure syndrome, blindness with disturbance of ocular reflexes, head rotation, circling and jacksonian epileptic episodes. see third, fourth, fifth ventricle. Watson, "Pyogenic brain abscess due to Streptococcus anginosus," The Medical Journal of Australia, vol. Citrobacter freundii brain abscess in a preterm infant: a case report and literature review. 6) On the other hand, Ludman found that the most common microorganisms in otogenic brain abscess were streptococci. The development of brain abscess during therapy was an unusual finding. It may manifest itself in various ways such as a CNS infection and a brain abscess. Taken together, we suggest that surgical resection of the brain abscess and the culture of tissue is necessary in cases where antibiotics are not effective. All consecutive cases diagnosed as brain abscess, extradural and subdural empyema, or combinations thereof were included in the study. Br Enlarging head size as the only presentation of Salmonella Typhimurium brain abscess in an infant: a short report. The bacteriology of a brain abscess is diverse and usually consists of a complex mixture of aerobes and anaerobes. proposed that medical management of brain abscess without surgical intervention may be successful in patients with illness duration of less than two weeks when four conditions are met. It turned out to be a rare and life threatening brain abscess. His distraught parents Craig and Barbara were told the chances of a child getting the fatal brain abscess was 7,000-1.